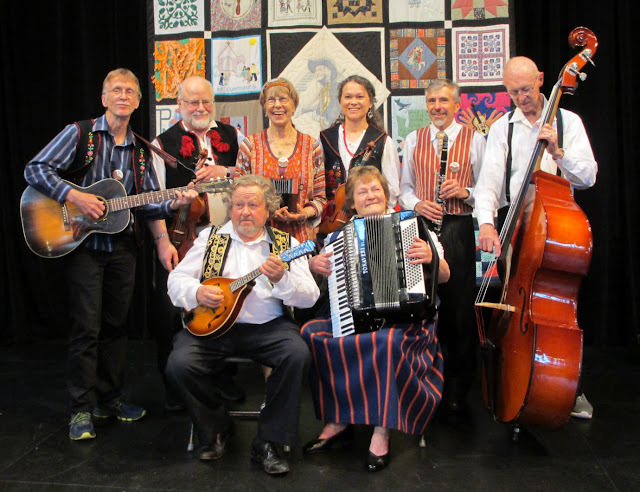 The Sweetheart Dance at Sno-King International Folk Dance Club on February 23, 2019 will honor couples who met at folk dancing - but everyone is welcome! 7:00 pm to 9:30pm at the Cedar Valley Grange, 20526 52nd Ave W, Lynnwood. Dance to live music from Folk Voice Band, with recorded requests at 7:00pm and during the band break. We invite you to do dances from around the world -- we do couple, no-partner, and set dances, and you don't need to bring a partner. We expect dancers from several clubs. The Grange has the best (wooden!) dance floor around, and lots of free parking. Wear an ethnic costume if you have one, or dress like a valentine in reds and pinks. Finger food potluck snacks are encouraged. The donation for the party is $8.00. The club also meets every Wednesday from 7:00 pm to 9:00pm, which is all-request night, and Saturday from 7:00-9:30pm, which has a program of dances, plus requests.